(Photo: © Peter Kenny / Ecumenical News)Cobus de Swardt, Managing Director of Transparency International speaking at the Graduate Institute of International and Development Studies in Geneva on "Creating a Culture of Transparency" on Sept. 30, 2015. GENEVA - Corruption is truly a key global issue, the head of Transparency International has told students at an elite international relations school in Switzerland. 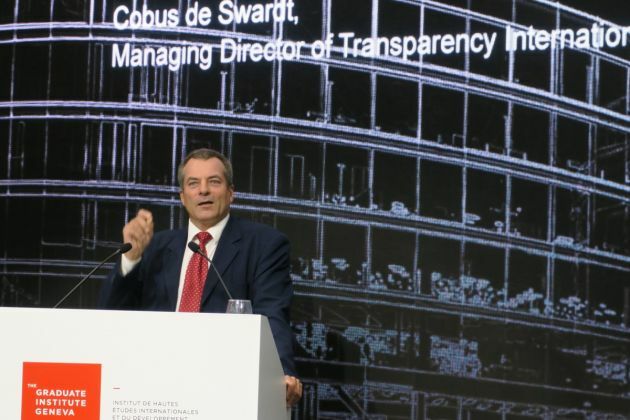 When Cobus de Swardt began as Managing Director of Berlin-based Transparency International eight years ago, people had told him corruption was not an issue of the times, being mainly of interest to lawyers and academics. "The demand for accountability across the world today looks dramatically different to what it looked even seven years ago. "Our issue is cemented as a global issue of our time," said South African De Swardt, speaking at the Graduate Institute of International and Development Studies in Geneva on "Creating a Culture of Transparency." He noted how corruption has become part of the lexicon in the Sustainable Development Goals approved by the United Nations in New York. Corruption is clearly one of the key impediments to the development of nations. De Swardt is a former chairman of the Cape Town branch of South Africa's ruling African National Congress party who was opposed to military conscription in the 1980s during the apartheid era, and jailed for it. He spoke on the same day that thousands of people in South African cities led by civic society and faith groups marched for the Unite Against Corruption initiative, but his Sept. 30 speech at the renowned Graduate Institute was coincidental. "Corruption is the abuse of public resources or public power for personal gain," says Corruption Watch. The TI head was introduced to address the worldwide demand for more open and accountable government and business and how society can we fight back against corruption and promote transparency and integrity. Through more than 100 national chapters worldwide and an international secretariat in Berlin, TI works with partners in government, business and civil society to put effective measures in place to tackle corruption. TI is a politically non-partisan and places great importance its independence and the group's MD said that unlike other big advocacy groups whose principles are unchanging, for transparency "the goal posts are always shifting." "Twenty five years ago in early 1990s the biggest issue was to create a political will to fight corruption. That was how TI was founded," said De Swardt. Then the issue became creating an international legal framework to fight global graft, to hammer out a UN convention against corruption and an OECD convention involving the world's wealthier nations. "It is today very much about the bottom up drive and outcry against corruption and the main drive against corruption also the main reason why we are set to remove corruption. "The notion that we are set to end endemic corruption around the world in the space of the next couple of years is not pie in the sky," De Swardt said. In recent times the landscape of societal pressures has changed, he explained. He noted that when TI held a key meeting a month ago in Malaysia, people in that country were protesting vociferously about the payment of $681 million dollars into the personal account of Najib Razak, the prime minister. Then, "Just a few days ago in New York we experienced a watershed moment when at the United Nations General Assembly new Sustainable Development Goals were approved," to replace the Millennium Development Goals. The new goals have at their heart accountability, sustainability and universal participation, with the involvement of civil society. "In Goal 16, we have a standalone governance goal that brings together for the first time corruption as irreversibly part of the global policy framework for the next 15 years," said De Swardt. The UN said bribery, corruption, theft and tax evasion cost developing countries $1.26 trillion a year and it has set a target to "substantially reduce corruption and bribery in all their forms." De Swardt said that 20 years ago most people knew that no country across the world could make sustainable progress to sustainable development if there were high levels of corruption. "It is a great tragedy it has taken 25 years for the world to say we can't have development if we don't tackle corruption," said the TI head while rejoicing at its inclusion on the global agenda. For its part, Corruption Watch says, "We believe that corruption corrodes democracy, undermines the rule of law and socio-economic development in both buying and selling countries. "We are concerned in particular with the role that the private sector from developed countries plays in exacerbating corruption and undermining governance in poorer countries." It is also concerned "with the ways in which developed country governments respond to this, ranging from collusion to weak enforcement of rules designed to tackle it, where they exist." The new UN 2030 Agenda for Sustainable Development includes targets to "encourage companies, especially large and transnational companies, to adopt sustainable practices and to integrate sustainability information into their reporting cycle." It also promotes "public procurement practices that are sustainable." The New York-based Interfaith Center on Corporate Responsibility has long said it "seeks a global community built on justice and sustainability through transformation of the corporate world by integrating social values into corporate and investor actions."